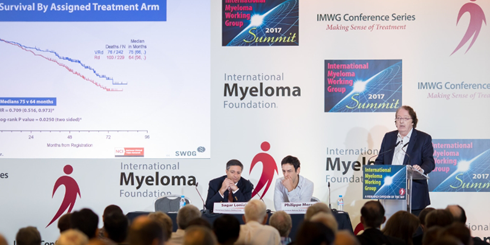 The International Myeloma Foundation (IMF) will host the 9th Annual International Myeloma Working Group (IMWG) Summit from June 11 - 13 in Stockholm, Sweden. More than 100 of the world’s top myeloma experts will attend the 2018 Summit, which convenes on the eve of the 23rd Annual Congress of the European Hematology Association (EHA), also in Stockholm. Throughout the IMWG Summit, myeloma experts will debate how best to treat patients in 2018 and beyond. Patients, caregivers, and doctors around the world can view a live-stream broadcast from the 2018 IMWG Summit on Wednesday, June 13, 2018. 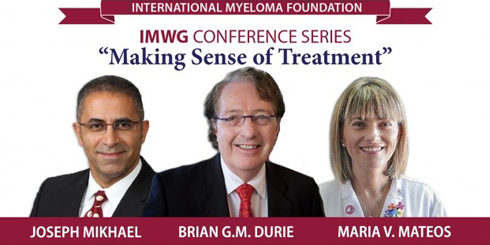 The IMF’s popular IMWG Conference Series, "Making Sense of Treatment.” IMF Chairman Dr. Brian G.M. Durie, Dr. María-Victoria Mateos, and IMF Chief Medical Officer Dr. Joseph Mikhael distill, debate, and discuss myeloma news from the Summit, from the European Hematological Association (EHA) meeting, and from the 2018 Annual Meeting of the American Society of Clinical Oncology (ASCO) during this 60-minute webcast. The live event starts at 6 a.m. EST. The live and archived webcast can be found at myeloma.org. 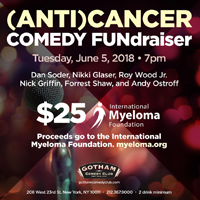 Comedians Dan Soder, Nikki Glaser, Roy Wood Jr., Nick Griffin, Forrest Shaw, Andy Ostroff, and others will perform on Tuesday, June 5, 2018, at 7 p.m. EST at the Gotham Comedy Club (208 West 23rd St., Between 7th and 8th Avenues) in New York for the (Anti) Cancer Comedy Fundraiser, with proceeds benefiting the IMF. Get your tickets today. 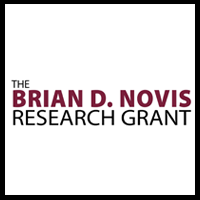 The Brian D. Novis Research Grants honor the IMF’s founder Brian Novis, who succumbed to multiple myeloma in July of 1992. The grants are awarded to researchers working in the field of multiple myeloma and related disorders, including smoldering multiple myeloma (SMM), monoclonal gammopathy of undetermined significance (MGUS), and immunoglobulin-derived amyloidosis. The 2019 grants will support senior research projects with $80,000 each and junior research projects with $50,000 each. The deadline for applications is Wednesday, August 1, 2018. 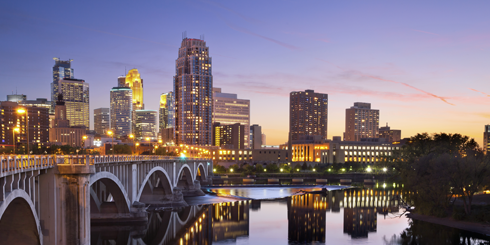 The IMF will conduct a Regional Community Workshop in Edina, MN, on Saturday, July 21, 2018. Registration is FREE, but seating is limited. 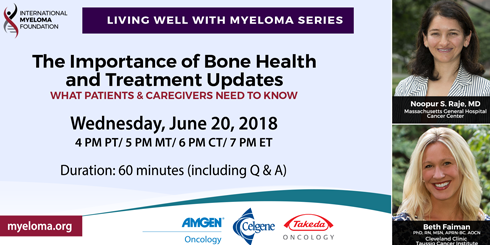 This is a wonderful opportunity to learn from and meet one-on-one with myeloma experts Craig Cole, MD (University of Michigan, Ann Arbor, MI); Martha Lacy, MD, Professor of Medicine (Mayo Clinic, Rochester, MN); and Teresa Miceli, RN, BSN, OCN (Mayo Clinic-College of Medicine, Rochester, MN).